Most people love cycling. But the reason why you will come across a few cyclists is that more than a few people hate constantly peddling for long. Well, if you are among this group of individuals, an electric bike is for you. 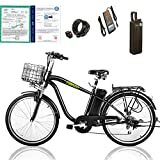 Commonly referred to as an e-bike, an electric bicycle is equipped with a high-performance battery that, in most cases, is removable and rechargeable. They also have high speed systems that allow them to move smoothly on any terrain. Based on their convenience as well as how they perform, it is advisable that you choose one. And that’s why our reviews have only focused on the best electric bikes. The ANCHEER Electric Mountain Bike is worth spending money on because of how it’s made. 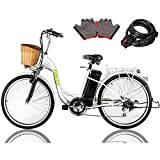 It has two working modes; E-bike & Assisted bicycle. The E-bike mode is perfect for cyclists who want to exercise or enjoy long time travel. Ideally, you can combine the two modes to get the best results. 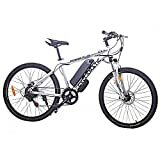 Since this mountain bike is electric, it is equipped with a 36-volt, 8AH ion lithium battery. It also comes with a smart lithium battery charger that will make you ride up to 25 – 50 km/s. This folding electric bicycle is powered by a 48V 12Ah Samsung Li-ion removable battery. Considering the effectiveness of this battery, the bike can reach top speeds of 20 miles-per-hour and cover up to 55 miles. What’s more, this bicycle has a foldable frame to make sure you can easily store and even carry it from place to place. You should, however, not think that the bike is flimsy because it is foldable. The aluminum alloy frame of the bike is high quality and very strong. 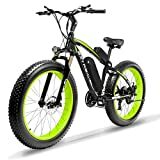 There is no way we can leave this electric bicycle out of these reviews. And this is because it is made of premium quality material yet it is amazingly affordable. To be precise, the frame of this bicycle is made of high-strength carbon steel for superior durability. This bicycle also features front V brake and rear expansion brake to make sure you can get the best out of it. Furthermore, it is equipped with a 6-speed transmission system to let you choose a suitable speed. If you are 5ft 4in. Tall and aged 14 years plus, this electric mountain bike is for you. It can cover 28 miles on a normal terrain and reach speeds up to 15mph. Well, this is because of its 36-volt upgraded lithium-ion battery. The bike is also stylish, and its bright silver brushed finish frame has mainly contributed this. Additionally, it is equipped with a 21-speed Shimano gear so that it can give you unlimited smooth rides. This electric mountain bike is easy to use and safe to ride even in the rain. To enable this electric bike to give you a smooth, fast, and accurate ride, ECOTRIC has equipped it with the exclusive Shimano 7 gears shifting system. They have also equipped it with a 36-volt lithium cell that is removable and comes with a smart lithium battery charger for ultimate convenience. 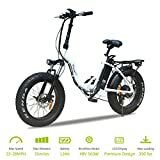 What’s more, this electric bike comes 90-percent pre-assembled, and this means you will not have any issues assembling it upon arrival. It has a weight capacity of 260 pounds, although it only weighs 58 pounds. The RICH BIT TP012 Electric Fat Bike seems expensive, but, in our opinion, it is worth it. This is because it is equipped with a 1000-watt motor that allows it to move on any terrain. It also has three cycling models to allow you to get the best out of it. Ideally, its 48V, 17Ah Li-ion battery also contributes to its incredible performance. The bike arrives partially assembled, and this means you will not take long to set it up for use. We are certain that it will give you smooth rides; thanks to its 7-speed gears. The 6061 aluminum frame of this mountain bike promises to offer maximum strength and superior durability. Because of the structure, the bike can easily carry up to 360 pounds of weight. Another feature that makes this mountain bike a top performer is a 500-watt motor that is powered by a waterproof and removable Samsung 48V*10.4Ah lithium battery. Well, the water bottle battery has more than 500 times recharge cycle, meaning you will not be inconvenienced in any way. The two 4-inch fat tires enable this bike to tackle the tough sand, road, and snow easily. NAKTO’s aim is to make sure that you go home satisfied and happy. 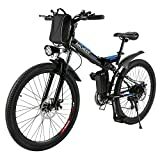 That’s why their 26” 250W Electric Bicycle (Male Black) has everything you are looking for. First, its 36V, 10Ah lithium battery cell is waterproof and removable. 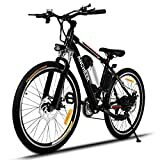 Second, the electric bike boasts 250-watt high-performance brushless motor that makes it powerful and fast. Also, there is a suspension fork & speed shift lever that will let you ride in a variety of terrains. Apart from delivering a powerful performance, the bike ensures night safety through its light LED spotlight. ANCHEER is also another company you will never go wrong with. It is a sturdy mountain bike that features a large capacity lithium battery. Since the battery is effective, it supports 25km (15.5 miles) on E-bike Mode and 50km (31 miles) on Assisted Mode. Besides, the battery comes with a smart battery charger that charges it fast for around 4 to 6 hours to eliminate any inconvenience. ANCHEER has also equipped this bicycle with an LED front light and horn for extra safety. Plus they have made it with a foldable design, so it can be easy to store after use. We think that the Addmotor MOTAN Folding Electric Bicycle is one of the best in its class because it can be folded when it is not in use. Its performance is also amazing, given that one of the most powerful batteries power it. To be specific, the battery is Panasonic lithium and has a rating of 48V/11.66Ah. Because of this battery, the electric bike can easily overcome steep hills and tricky terrains. The bike is also sturdy, and it is designed to fit adults from 5’4” – 6’4”. It is time to take your cycling experience to another level. And all you need to achieve that effortlessly is an e-bike. Sturdy and convenient, an electric bicycle will give you an opportunity to enjoy cycling to the fullest. That being said, we hope that this piece will help you big time.